My name is JC and, this was my lovely first attempt at cross *pun intended* dressing. 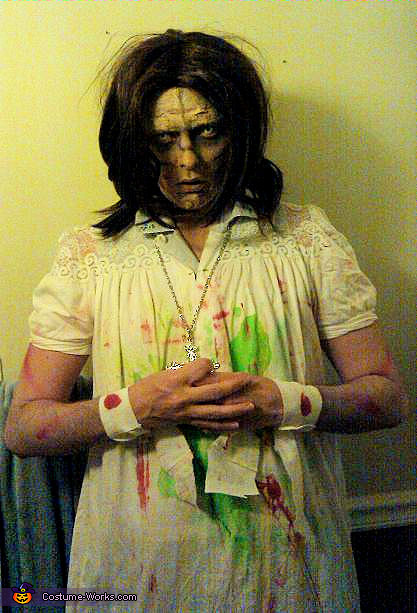 I was Regan from the Exorcist. This costume was rather simple. I re-purposed an old wig and nightgown, and splattered it with green and red food coloring. The makeup is layers of toilet paper,Elmers glue and again, food coloring. I added strips of cloth to the wrists to mimic a stigmata effect, and wore bedroom slippers. The only item that cost more than 5 bucks, were the "zombie" contacts, purchased at coastalcontacts.com.